39 down, 16 to go! In 2013, inspired by a story of a mom trying to get outside every weekend, Brian and Lori Miller, along with their two children, Leah and Collin, set out on their quest to visit all 55 state parks. 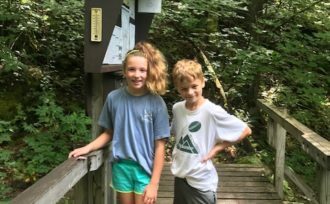 For the Millers, the geographic and financial accessibility of Vermont State Parks make the parks the perfect fit to set aside family time outdoors, unplug, and have fun. Here is an update from their latest adventures this summer. As I sit here on the snowiest November on record, I’m trying to relive the warm, green memories we have from this summer as our quest for all the Vermont state parks continued with visits to Quechee, Burton Island, Camel’s Hump, and Woodford. It’s hard to imagine right now with all this white on the ground, but in August, with all of our camping gear in tow behind our bikes and on our backs, we boarded the island ferry to head to Burton Island for a family camping trip. This was quite the opposite of the touristy Quechee experience we started the summer with! The weekend was filled with lots of fishing, wiffle ball games, swimming, and a beautiful canoe ride around the island with a gorgeous sunset. It became clear to us why people visit Burton Island again and again, making reservations long in advance. It was lovely to forego electronics, cars, and other so-called conveniences in exchange for our tent and the ability for the kids to ride their bikes around anywhere. We definitely want to go back! In September on a nice fall day we went for a short hike on the Forest City Trail at Camel’s Hump State Park. We enjoyed climbing on the rocks along a brook and making rock sculptures. It’s sometimes nice to enjoy the outdoors without the production of packing everything up and preparing food for an entire weekend. We wrapped up the summer with a Labor Day Weekend trip to Woodford down south. We’ve hit the point where the remaining parks are mostly farther away now, which factors in when it comes to travel time. Aside from the drive, Woodford was great. We rented a SUP, which was quite comical from my picture-taking perspective on the shore as Brian, Leah, Collin AND our new dog, Webster paddled around – all sitting down, with the exception of the dog who was quite hilarious trying to get onto the paddleboard and then jumping off! The current tally of our family quest is 39 out of 55 Vermont State Parks . We were hoping to hit the 40 mark but were just shy this summer. It’s okay, though! That will just extend the fun. We have not been disappointed by a single state park, and we are always looking forward to our next outing!